I decided to add a new section to acknowledge the individual workmanship that goes in to handmade picks! Pick hand made by Les Paul!!! Click here under 'Vintage Picks' to see this very special one! Unfortunately I have to keep these 3 beautiful picks in the US as they're not allowed to be exported! 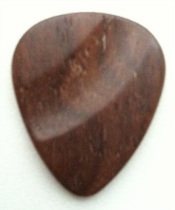 Surfpicks are made out of Lignum Vitae, which is an amazing wood. A thin sliver can withstand constant banging against steel! The wood is incredibly dense. It is over 3 times as hard as White Oak! The cellular structure of Lignum Vitae is saturated with it's own natural oil. A finished piece is as smooth and cold as a piece of marble. Lignum Vitae is the strongest and most dense wood, on the planet. It will sink, even in salt water. Hundreds of years ago, it was indispensable, for fittings on the tall ships. built around 100 years ago.. and is still in use in many of those dams. as propeller shaft bearings, on some U.S. Naval ships. LV needs no finish, wax or oil, when properly crafted. Fine sanding is all that is needed for a spectacular piece of art. Don't leave it too long, as LV might not be around forever! At first I didn't want to play with this because it looked to special so it sat on my desk! Even though I have other wooden picks, I must admit I've never tried playing with them because they alway seemed too hard and I couldn't get my head around playing with a wooden pick! Recently I've started experimenting with more solid picks and found that once you throw away your preconceptions, they're actually really easy to play with! What I loved about this pick is that it has a really lovely warm tone and the wood just slides off the strings. Perfect for gypsy jazz! Alex can also customise the pick with your initial - now that would be cool! Alex Bishop specialises in the construction of finest quality hand-crafted and custom-built gypsy jazz guitars. Although he predominantly builds Selmer-Maccaferri style guitars, he offers a range of contemporary design features. These include side sound ports, chamfered arm rests, custom rosettes and a modern re-interpretation of Mario Maccaferris own resonating chamber for both oval and D-hole instruments. Unlike most luthiers, he also makes his own picks - a really nice addition to any custom guitar! The picks are 3.5mm thick and hand crafted from ebony & really highly polished until they are beautifully smooth! They are inlaid with mother of pearl making them the perfect Gypsy Jazz pick! Click on a photo to go to his website to see his craftsmanship. These beautiful 'Le Niglo' picks come in a variety of metals. 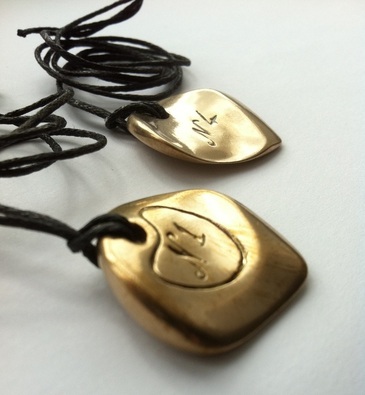 These are bronze, but they also come in silver & if you want something extra special, gold! They're very tactile and sit nicely in your hand. No. 1, thicker than No. 4, and softer at the tip, giving a jazzy, mellow sound. The NG. Close to the N4. All picks come with a waxed cotton cord so they can be used as a pendant, or wrapped around the wrist in case you drop it while playing. Click on the photo to go to their website. UPDATE: Here's a lovely trio of new additions to the Niglo family! The wood and horn ones have been laser cut and completely handcrafted. I love 'steampunk' so was immediately grabbed by this handmade pick! Eric Fueurmann is a French craftsman. He has made many picks out of various mediums, including wood, acrylic, glass, metal, carbon fibre and even crocodile skin! It's made from Thule wood with an ebony back. The mechanism comes from various watches and is set in an epoxy resin. At 8mm thick I think it would be thick to use but it's too nice to use anyway! These were originally a mahogany bookmark owned by Joe Macey which was given to Carl Pepka to carve into beautiful picks! Carl Pepka has made some absolutely stunning picks in the past, really beautiful designs so it is an honour to have these worked by the craftsman. Handcrafted in France by Jean-Charles Dugain since 1977. This is really tactile with the curvacious thumb and index finger grooves! About 3mm thick and very rigid. Dugain picks are made in a variety of materials including horn, bone, wood, stone, metal, acrylic, delrin, acetate, glass, mammouth ivory, cocount shell and mother of pearl. 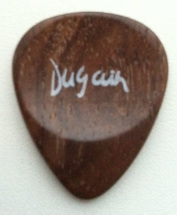 In the mid 1970's, Jean-Charles Dugain began experimenting with the plectrum. Playing regularly in the close atmosphere of the Paris jazz club scene his hands tended to sweat, making it hard for him to grip the smooth plastic of the pick and maintain it in the desired position. . He tried carving a plectrum from wood and found that the natural absorbency helped, whilst the texture of the grained surface made for increased airflow and a better grip. . But that wasn't all he found. The overall tone was deeper, richer, more resonant and responsive to the string. . Soon he was hooked. . At first he tried using a range of different woods, finding that each had its own subtle difference and individually distinctive sound. . Horn and bone were to follow, then metals such as bronze and silver, semi-precious stones, and even mother-of-pearl. Today he handcrafts plectra in a wide range of natural materials, and each Dugain pick has its own particular character, lending different things to different players in every genre, from jazz, classical, folk and country, right through to blues, rock and metal. Click here to go to the Butterfly Finger Picks page. Made from TAGUA NUTS!!!! Click here to go to my Howling Monkey page! Click here to go to my Lifeblood page. Click here to go to the TuskBuffer page. This was hand made for me by Ken Francis of Francis Guitars. It has a really lovely curve that fits the thumb nicely and feels very natural! Bone also has a good tonal properties that allow the sound to really cut through. I also tried it on my ukulele and it made a good percussive sound on the wood when strumming!